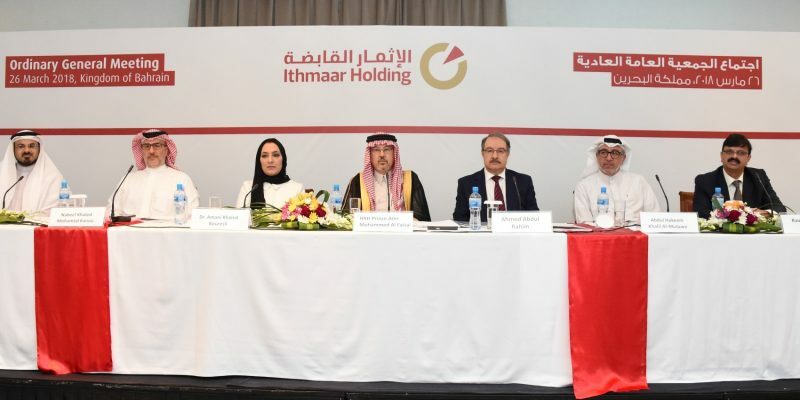 MANAMA, BAHRAIN – 26 March 2018 – Ithmaar Holding B.S.C. (formerly Ithmaar Bank BSC) [“Ithmaar”] [“the Group”] hosted today (ed note: 26/03/18) its Annual General Meeting (AGM) and the consolidated financial statements for 2017 were approved. The meeting was chaired by Ithmaar Chairman, His Royal Highness Prince Amr Al Faisal, and attended by members of the Ithmaar Board of Directors, its executive management team and its Sharia Supervisory Board, as well as representatives from the Central Bank of Bahrain (CBB), the Ministry of Industry, Commerce and Tourism, the Bahrain Bourse, and statutory auditors PricewaterhouseCoopers. Speaking to shareholders, HRH Prince Amr said Ithmaar Holding’s 2017 achievements are paving the way for the Group’s continued transformation, and set the stage for a return to sustainable profitability. “We are pleased to announce that, with the new group structure fully implemented at the start of 2017, Ithmaar Holding’s efforts during the year were directed at taking important steps towards significantly transforming operations in line with the strategic decisions taken by shareholders in 2016,” said HRH Prince Amr. “One important initiative was the successful listing of Ithmaar Holding shares on the Dubai Financial Market on 29 January 2018. This additional listing, which added a new key market alongside our listing on the Bahrain Bourse and Boursa Kuwait, opens trading on Ithmaar Holding’s shares to new, exciting markets. This, in turn, creates new investment opportunities for investors in the GCC markets. Ithmaar Holding is traded, on all three stock exchanges, under the ticker ITHMR,” he said. “Ithmaar Holding’s two wholly-owned subsidiaries, Ithmaar Bank and IB Capital, and their various subsidiaries, associates and other investments, also took important steps throughout 2017 to support the Group’s transformation,” said HRH Prince Amr. “Ithmaar Bank, for example, embarked on multiple strategic initiatives designed to bring about transformational change to the Bank. The initiatives, some of which are in the process of implementation, include upgrading the core banking system and enhancing the e-Banking offering to make the Bank more customer centric as it embarks on its next growth phase, as well as introducing a new consolidation, budgeting and planning solution. A new application has been implemented to facilitate compliance with the new FAS 30 accounting and regulatory requirements,” he said. Ithmaar Holding Chief Executive Officer, Ahmed Abdul Rahim, said the Group is taking important steps in the right direction, including a greater focus on its core retail banking business. This has been evident in the positive results achieved by Ithmaar Bank during 2017.
and, perhaps more importantly, for its role in, and support for, the community,” said Abdul Rahim. “Meanwhile, Ithmaar Bank’s flagship subsidiary, Faysal Bank Limited, already one of the most prominent retail banks in Pakistan, continued its remarkable growth in 2017, adding 50 new branches throughout the year to bring the total number to more than 400 branches,” he said. HRH Prince Amr and Abdul Rahim both stressed that the Group’s 2017 achievements would not have been possible without the continued support of shareholders and the guidance of regulators. “We take this opportunity to thank the Board and all our shareholders, as well as the CBB, the Ministry of Industry, Commerce and Tourism, the Bahrain Bourse, Boursa Kuwait and the Dubai Financial Market,” they said.